The idea to release a joint album "Awakening" was born after the performance of Alim Gasimov at Morgenland festival. This director of the Morgenland festival and Awakening project manager Michael Dreyer said this at the press conference in the Azerbaijan National Conservatory. 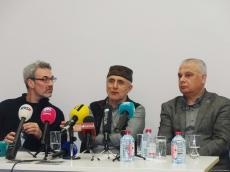 Alim Gasimov noted that the People’s Artist of Azerbaijan, pianist Salman Gambarov and kamancha singer Rauf Islamov also took part in the recording of the album. The mugham singer stressed that Morgenland Festival is held annually in Osnabruck (Germany). During the festival, participants from different countries perform music in different genres and directions - folk, classical, jazz, rock, etc. In turn, Salman Gambarov and Rauf Islamov spoke about the work on recording the album, as well as the works that are included in it. One of the world’s truly gifted singers, Alim discovered the world of mugham as a child, when he began singing for his own enjoyment. He grew up in the town of Shamakhi, 100 km northwest of Baku. "I had no idea that I would become a singer," he recalls. Gasimov continues to play an important role in promotion of the Azerbaijani culture, especially mugham around the world. He was awarded the International Music Council-UNESCO Music Prize, one of the highest international accolades for music in 1999. For that achievement, he was quoted by the New York Times as simply one of the greatest singers alive, with a searing spontaneity that conjures passion and devotion, contemplation and incantation. Also known as an artist of supreme versatility, Gasimov has collaborated and performed with some of the world’s leading musicians, including Yo-Yo Ma, Kronos Quartet and Jeff Buckley. People's Artist of Azerbaijan Alim Gasimov was one of four Azerbaijanis among the 500 most influential Muslims in the world, chosen by competition, conducted by the Center for Strategic Studies and the famous American Georgetown University in Jordan. Michel Godard is a French avant-garde jazz and classical musician. He plays tuba and the predecessor of the tuba, a brass instrument known as the serpent. At 18, Godard was a member of the Philharmonic Orchestra of Radio-France. He has also been member of the French National Jazz Orchestra and the Arban Chamber Brass quintet, and has played with the Ensemble Musique Vivante, the ancient music Ensemble La Venice and "XVIII-21Musique de Lumieres". Godard has participated in projects with Michel Portal, Louis Sclavis, Enrico Rava, Michael Riessler, Horace Tapscott, Christof Lauer, Kenny Wheeler, Ray Anderson, Rabih Abou-Khalil, Sylvie Courvoisier, Simon Nabatov, Linda Sharrock, Pierre Favre, Misha Mengelberg, Gianluigi Trovesi, Willem Breuker, Gabriele Mirabassi, the ARTE Quartett and more recently in a quartet with co-tubist Dave Bargeron. His album Three Seasons (HGBS, 2014) with Günter "Baby" Sommer and Patrick Bebelaar) was awarded Album of the Year 2014 by The New York City Jazz Record. The album "Stupor Mundi" (2015) with Patrick Bebelaar, Vincent Klink, Gavino Murgia and Carlo Rizzo was awarded the German Record Critics' Award. Godard has also played and recorded with the pipeband of the Brittany town Quimper, with reggae star Alpha Blondy, and with Canterbury rock musicians John Greaves and Pip Pyle. As a composer, he has been commissioned by Radio France, Donaueschingen Music Festival, and the French Ministry of Cultural Affairs.